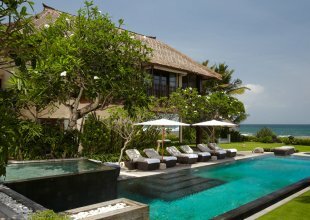 This classic magnificent villa is located in the quiet area of Seminyak, Bali. With an expansive outdoor patio, private pools, and astonishing views of it’s own lush gardens, its serene, quiet surroundings are reminiscent of a paradise set amidst Seminyak’s cosmopolitan community. As you enter Villa Samuan, you will be greeted by the awe-inspiring Balinese hospitality, with warm and friendly staff, graciously attending to all your needs. 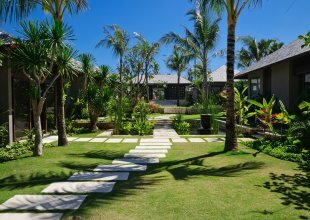 All around the villa is a luxurious experience complete with modern appointments and an intriguing blend of contemporary and Balinese décor, in a fusion defying the traditional East meets West concepts. It is a perfect spot to enjoy a stress-free holiday in a tranquil and intimate environment away from the crowds, but provides easy access to modern restaurants, shops, cafes, and bars. You would not want to leave the comforts of your villa as you can arrange for a day of pampering in a private spa, with a relaxing and soothing massage. 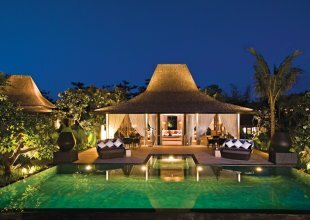 You may also opt to laze in a luxurious daybed beside a pool set at the heart of lush coconut-tree garden, while savouring a refreshing tropical cocktail and snacks, prepared by our excellent chefs. More than just a hidden getaway, it is a modern paradise breaking traditional concepts of luxury and serenity. The ingenious merging of modern amenities and traditional Balinese setting is a reaffirmation that paradise can be enjoyed by you and your family.